There is something about this photo that I like. Even though it’s a solitary scene, it seems to call out to me, like a personal invitation. 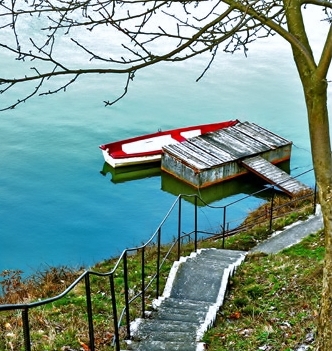 The little red boat sits at the end of a railed, clear path next to the landing, waiting to take me wherever I want to go. There are many times in life when a challenge, a chance, or an opportunity, like the little red boat, will present itself. Maybe it comes in the form of a possible new job or new relationship, or instead as a chance to confront a problem, to achieve a personal goal or to deal with a change. As part of the human condition, it is inevitable that we will experience these moments from time to time. We may feel excited to try something new, or feel anxious or worried that we may not be up to the challenge. We may feel both excited and anxious at the same time! We want to know that we are making the “right” choice. The question is this: when faced with a challenge, a chance, or an opportunity, do you choose to take it on, or do you let it go? Maybe in the past you’ve done both. There have been times when you’ve seized a chance, and other times when you’ve avoided a challenge. Maybe, in that moment, you made the best possible choice for the circumstances, or maybe you harbor regret that you didn’t act. So how do you decide the best way to proceed the next time (there will be a next time) you are presented with a choice? 1. What do I want to accomplish? And why? 3. If I am hesitant, what is stopping me from acting? 4. What do I have to do to be successful? 5. How do I think I will I feel if I accomplish it? Once you’ve asked and reflectively answered these questions, you will have created a starting point and a guide to help you to discern the best course to take. Although you needn’t do so, writing the answers may provide you with a clear and tangible way to “see” what making a particular choice may truly mean to you, and show you a way to take the next step.